Since making its debut on the Mac platform in 2005, Billings has established itself as a suitable program for people who needs to track time as a necessary part of their business process. Lawyers, consultants, and artists have found that Billings suits their needs perfectly, but it has also proven valuable for those trying to avoid invoicing customers in the impersonal-and-vaguely threatening “hostage letter” format that most business accounting applications seem to use. The latest version, Billings 3, features a completely redesigned interface that retains the workflow of earlier versions of the program but which now sports a more useful and Leopard-like look. The updated time-tracking and billing application continues to give small business users an easy and elegant way to track time and create beautiful, fully customizable estimates, invoices, and statements. Billings 3’s main window consists of four panes, and users can switch between Projects and Account views. Projects view allows you to look at all your open projects and, at the time, slips associated with those projects. Account view gives you a financial perspective on your business, allowing you, at a glance, to see which of your clients have open or overdue invoices; it also provides you with visual cues as to the customers you’ve yet to invoice. The application’s new interface will be familiar to anyone who’s ever used Apple programs such as iTunes or iPhoto. The upper left pane of the Billings application window contains links that let you see active projects and working slips for all your clients; a listing of all recurring automatic invoices and available reports; personal projects that aren’t associated with a specific project; and a collection of all your active time slips and clients. You can easily organize clients into your own free-form subgroups. Selecting any item in this pane provides you with more specific detail, including customer contact information, outstanding balances, unsent invoices, and overdue bills. 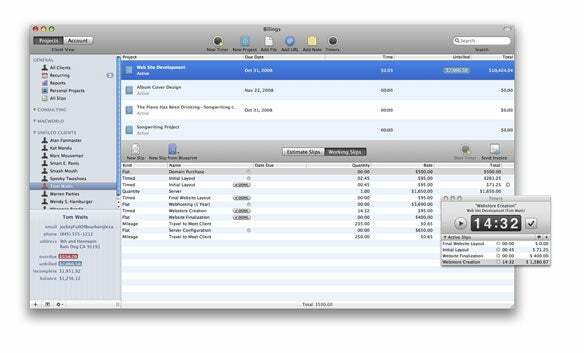 Billings uses Mac OS X’s Address Book to manage your business contacts. During Billings’ initial setup process, you select the contacts from Address Book that you want to appear in Billings. These contacts are then added to a Billings Address Book group. Unfortunately, Billings 3 continues to use Address Book to manage your contacts after the initial setup. To add new users to Billings, you either open Address Book and drag a contact from your Address Book database to the Billings group or select Add Client from Billings’ File menu to link to the existing contact. If the contact doesn’t already exist, you click on the New Client button in Billings’ Add Client dialog box, which opens the Address Book application, where you can create the new contact. Personally I prefer my business applications to have their own contact databases, because I don’t like to have my business information commingling with my personal info, and I don’t like having to jump between two applications to manage my contacts. Billings makes this “sharing” process reasonably hassle-free by allowing you to easily turn existing Address Book contacts into Billings contacts, but I’d be much happier with Billings if it had a contact database of its own. Right Tools for the Job: Billings 3 offers beautifully designed tools for handling all your time-tracking, invoicing, and estimating needs, helping you create equally beautiful estimates, invoices, and statements. Using Billings 3 is a snap. Once you set up your clients, you do no more than four clicks—and often as few as one—to get the clock rolling on any of your projects. But while easy time tracking is a huge advantage of the program, great-looking estimates, invoices, and statements are Billings’ crowning glory. The program ships with 30 professionally designed templates, any of which is suitable for most businesses and all of which can include your own logo or branding information. But you can also create your own templates, using Billings’ built-in design tools. Based on the program’s built-in templates, these tools are capable of creating amazing-looking, information-rich documents. Unfortunately, there’s a dearth of documentation on how to use this feature, and after trying to work with it for about two hours, it was clear that I’d need some. (It took me 20 minutes alone to figure out how to add a data field to my template.) Marketcircle acknowledged that these design tools were difficult to use and has recently added several how-to videos to its Web site. Beyond the difficulty of creating my own business documents, I have some minor quibbles with Billings 3, none of which are deal-breakers, but all of which are annoying. First, Billings provides too few fields to identify your business. At a minimum, there should be five fields for company name, contact name, and contact information, such as phone number, street address, and e-mail address. Billings provides only four. Second, Billings lacks support for minimum time billing; you should have the option to charge a customer for some predefined dollar amount if the time worked doesn’t meet a specific threshold. Third, because Billings isn’t an accounting application, it’s likely that you’ll need to get your Billings info into an accounting program come tax time. It’s possible to export this information now, but the process is tedious. Billings should at least provide a simple way to export a year’s worth of billing data. Finally, it’s common to have several points of contact at one company, but one point of contact for invoicing and billing statements. Billings provides no way to combine individual contacts under the canopy of a single company, so there’s no way to send a single invoice for work done for a variety of contacts. Despite these complaints, the updated Billings is an excellent time-tracking, invoicing, and estimate program that allows small companies to create a big impression. Full-featured and well-designed, Billings 3 is a powerful tool that’s a pleasure to use. Editor’s Note: Updated on December 29, 2008 to change the pricing so that it reflected a price cut that became permanent in December.